The Titans once again were up against a top team in the Rattlers played a strong match, directing 55 shots on goalkeeper Babin, whose team has the best defensive record in the League, but in the end Bradford still won 5-3. 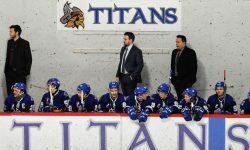 For a second consecutive evening, the Titans were involved in a very good Hockey game. It is only necessary to agree sometimes that the merit of a victory goes to the opponent. The Titans have no shame for this defeat. The Rattlers are reputed to be the best team in the league and this reputation was showed in evidence tonight. The Rattlers have earned 53 points on a possibility of 58 this season. That said, the Titans have been in the game all along the 60 minutes. Alexandre Provost-Ross had a second consecutive productive offensive event, scoring 2 goals. Ralfs Circenis was the other goal scorer and added an assist. Adding two helpers was Dayton Murray. Tyson Lambert was added to the list of injured players, leaving in the second period. He joins Lilliecreutz, Vandal, Chenier and Berg-Langeli. Kansas Hart was ejected early in the first period for fighting. He was also issued a penalty as an instigator would normally be 2 games of suspension. The Rattlers will be in Ville-Marie tomorrow night, while the Titans will only play their next game next Friday night in South River.